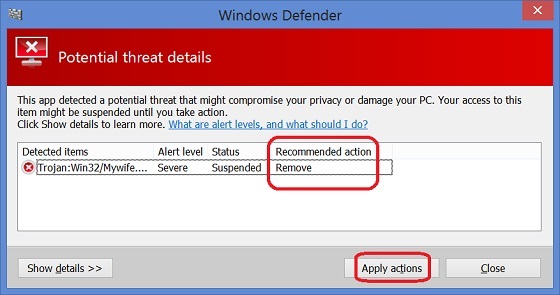 How to remove threats detected by Windows Defender? You can follow this tutorial to remove malicious threats detected by Windows Defender. 1. On the Windows Defender scan result screen, click "Show details" under the "Clean PC" button. You see the threat details screen. 2. Set "Recommended action" to "Remove" on detected items. 3. Click the "Apply actions" button. Windows Defender will remove detected items from your computer. 4. Wait for the remove process to finish. This may take a few minutes, if the malware is buried in large ZIP archive files.